I was greeted by Editor-In-Chief Axel Alonso. Turns out, I was not only going to get a chance to read Nova #1, but also #2, as well as Thanos Rising #1 and Guardians of the Galaxy #0.1 and #1. Axel and the guys at Marvel want to give the Cosmic Marvel Universe new prominence and bring it (back) to the forefront of the MU in general. And they really mean it, if the A-list creative talent is anything to go by! Axel confirmed that all three books are heading towards a major Marvel Universe Event later this year, probably late summer. We’re talking about after Age Of Ultron, and unrelated to that. And while the name of the Event and what it encompasses are still a mystery to me, I think it’s a pretty solid bet that Thanos will be at the center of it. Axel did reveal that like Avengers vs X-men, there will be a precipitating moment that will bring all the characters together and lead into the Event. And that the top secret (even to me!) Marvel FCBD book has something to do with it. Axel sat me down in a vacant office, handed me a big stack of clipped-together pages, and told me to dig in. I had in my hands a fully composited, pretty much complete Nova #1, the full plot/script to #2 along with uncolored, unlettered art, the full plot/script for Thanos #1 along with about 1/2 of the uncolored/unlettered art, the almost complete GotG #0.1 (some pages were still uncolored, but it was fully lettered), and the full plot/script to GotG #1. This mini is apparently going to delve very deeply into Thanos’ origin. We all pretty much know that he’s the son of Mentor (the leader of the Eternals from Titan, one of Jupiter’s moon). That he’s obsessed with Death (as in the cosmic entity). And that he’s tried to either take over or destroy the universe on more than one occasion (fortunately, never successfully). But we’ve rarely looked at his early years, literally, as a child. And that’s what this series is about. In this issue, we see Thanos as he was born, and through his early teen years on Titan. And we find out maybe why he’s so obsessed with Death (hint: she’s been by his side the whole time). Writer Jason Aaron (Scalped, Wolverine And The X-Men, Incredible Hulk) delivers a solid first issue, that’s not too dense with stuff you wouldn’t care about , but not too little so it leaves you wanting to know more. And there’s not much needed to be said about artist Simone Bianchi (Wolverine, Thor: For Asgard, and lots of covers). Gorgeous art as usual, though I think I’m going to miss the uncolored art. Definitely a can’t-miss book if you’re a Thanos fan, or if you simply want to know more about him, especially after his cameo in the Avengers movie! You have to be living under a rock if you don’t already know that there’s a Guardians of the Galaxy movie coming next year. So you know this book is going to be pretty important in the grand scheme of things. The fact that Marvel has one of their top creators writing the series should also speak volumes. Issue #0.1 provides the full (and revised) back story on Peter Quill, better known as Star-Lord, leader of the Guardians. I can’t say much without really ruining the entire issue, so let’s just leave it at it’s a good origin story, especially if you don’t know much about him and even if you think you do, it’ll probably be good to read this updated take on it (especially since it explains why he’s not a big fan of his dad). It also very neatly explains why Iron Man decides to the join the group. #1 sets up the premise that a bunch of galactic royalty/politicians have decreed that Earth is not to be touched (for as-of-yet-unknown reasons). 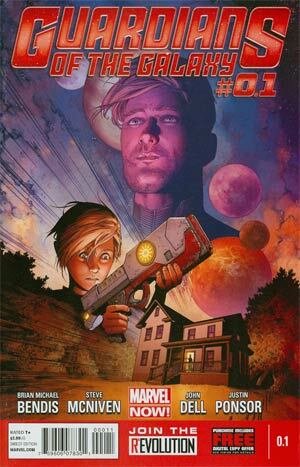 Of course, that means Earth now has a big fat target on it, and Star-Lord’s father manages to play his son exactly as he wants to, resulting in Peter and his team acting as Earth’s cosmic defenders, which immediately comes into play in the first issue. The story and dialogue by Bendis (Powers, Avengers, All-New X-Men) are exactly what you would expect from him (excellent), especially in #1, and the Steve McNiven (Civil War, Nemesis, Captain America) artwork is sharp as always. You know right off the bat that this book and its characters are going to play a key role in whatever Marvel’s got cooking for the summer. It’s been commented before that Nova was always part Spider-man, when it came to his story and origin, and this is very much the case here. This series focuses on Sam Alexander, the Nova (he’s not the only one) who recently appeared in AVX, where he was offered a spot on the Avengers. With issue #1 we’ve backtracked a bit in Marvel time to Sam’s origin. We find out that his father was a Nova Corps member who has been on Earth the last 15 years, and started a family that includes Sam and his younger sister. But he’s a bit of a has-been at this point, barely making it as a janitor at Sam’s high school. And while Sam’s younger sister delights in hearing them at bedtime, Sam dismisses his father’s Nova Corps stories as just that, stories. Until one day his father disappears, and shortly thereafter, Gamora and Rocket Raccoon (from the Guardians of the Galaxy) show up with the Nova Corps helmet that Sam has seen sitting in his father’s garage all these years. #2 deals with Sam finding out that just maybe his father’s stories were true, and him trying on the helmet and discovering his new-found powers (as provided by the Nova helmet). In the course of testing his new abilities, he crashes on the moon and encounters a certain giant, bald-headed, and very displeased observer. As someone who enjoyed Jeph Loeb’s (Batman Long Halloween, Marvel “color” minis, Hulk) writing in the past, but not recently, I was *really* wowed by Nova. Reading through these two issues was a real treat. 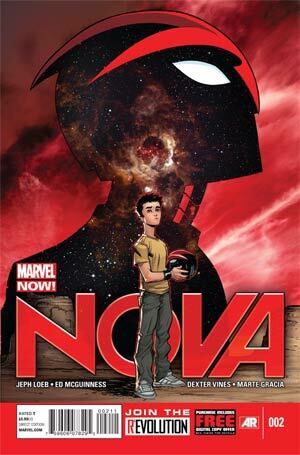 It’s a great starting point for people not familiar with Nova, and it’s a great new chapter for those that are, without dismissing anything that’s been established before. The storytelling and pacing were great, and you really felt as though you were reading a new spin on Peter Parker/Spider-Man’s origin, but in a wholly new setting and context. And the visuals as provided by Ed McGuinness (Superman/Batman, Hulk), a frequent collaborator of Loeb’s, were spot on in visually capturing what Sam must have felt going from thinking he has a loser dad to finding out he may just have to carry on a family legacy as a Nova Corps member. This book is definitely a must read. Never liked Nova? Read it. Love Nova? Read it. As a fan of the Cosmic characters (one of my earliest comic purchases was Silver Surfer #45, a major lead-in to the now-classic Infinity Gauntlet), I have to say that I got a real kick out of reading these, especially knowing that they are all leading to something big. The other great thing about reading the scripts back to back, which I never get to do, is to see the different ways in which three different top writers present their plot/scripts to their artists. No one is better than the other. Just different, from the density of the script, in allowing the artist creative license, to the “directing” of each page and panel. It was really awesome to see how it’s done. Before I left, SVP Of Publishing Sales & Circulation David Gabriel pulled me aside and gave me a sneak peek at the foil cover for Age Of Ultron #1. This was an actual printed sample of what the final cover would look like, not a mock up. It was not what I expected at all. Only the Ultron figure has foil enhancements on him but in such a way that the original coloring is still intact. Pretty awesome looking! You may be able to see for yourself sooner than you think as Marvel will be sending a sample to all retailers that are registered with their MRRC program in the next week or so with the goal that retailers ( and their customers ) will get a chance to see it before retailers have to commit to their final order on Feb. 11th. Keep an eye out for it! So, to wrap up, I can say with full confidence: you should read these books, not just because they going to build to something important but because on their own or together they are great reads. 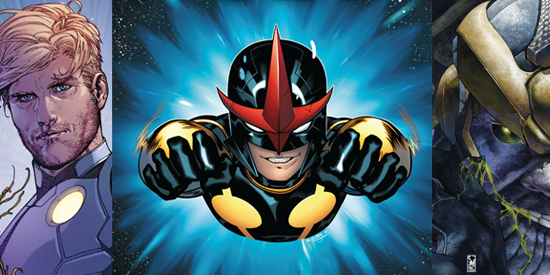 And if that’s not enough, or cosmic stuff just isn’t your thing, then at the very least, you should give Nova a try, because it was just that much fun to read. If I’ve managed to convince you to try out these books, you can preorder them from the Midtown site here. All these books have ship dates from late February to April (more info can be found on the Midtown site).